Rashika Padarath is the co-founder and owner of Andira Urban Services. She is an urban planner who specializes in sustainability and stakeholder dialogues. Rashika designs and delivers custom dialogues to organizations utilizing appropriate dialogue methods and tools. She has been active in the field of dialogue for more than eight years and has had the privilege to provide dialogue services to both the private and public sector. During this time, Rashika has honed her skills of using dialogue as a philosophy to help teams and organizations better understand each other as they work together. Applied ethics is often core to the design and delivery of dialogue processes. 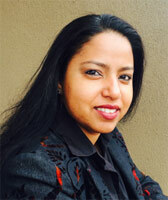 Rashika is a seasoned facilitator that works with several institutions including the University of the Witwatersrand (Wits), Duke Executive Education, the University of Stellenbosch Executive Education (USB-ED) and Henley Business School where she facilitates in the areas of urban planning, sustainability, dialogue, operations and leadership. She also undertakes research in planning, sustainability and dialogue and has written both her Master’s thesis on different aspects of these concepts.